When a home is represented by the Sotheby’s International Realty brand, it is presented to a highly qualified global clientele through exclusive channels and relationships. Our proprietary network of residential brokerage companies is comprised of 900 offices in 70 countries worldwide, making Sotheby’s International Realty a truly global real estate brand. Our eGallery and global brochure distribution programs create a unique, worldwide reach for your home. The Sotheby’s International Realty eGallery is a real-time, dynamic property slide show displayed on high-definition screens in the Sotheby’s International Realty and Sotheby’s auction house locations around the world. Our global brochure distribution program sends your property to a front office display in every Sotheby’s International Realty office and auction house. We partner with leading media powerhouses to deliver content to discerning audiences worldwide. Our partners’ cutting-edge innovation, strategic positioning and international impact enable the Sotheby’s International Realty brand to successfully connect with a global clientele. PropGOLuxury.com was created to fulfill the high demand of our affluent Chinese consumer base requesting exclusive properties from around the world. PropGOLuxury is the largest and fastest-growing property portal in the China and Asia Pacific region. Juwai.com – Demand for luxury properties from Chinese consumers continues to grow. One out of every 10 visitors on sothebysrealty.com is located in China. In an effort to expand the brand’s reach in China, we launched a syndication partnership with Juwai.com, one of China’s premier real estate portals, with over 2 million monthly visitors. Luxuryproperty.zaobao.com is the flagship Chinese website of Singapore Press Holdings (SPH). With international news, lifestyle and entertainment content,it reaches an audience of over 10 million monthly Chinese language visitors. Z-Property is Zaobao’s real estate channel, with a focus on lifestyle, décor and high-end homes. Properties must be $1,000,000 usd or greater. Nikkei is the most influential news publication in Japan and one of the major media powerhouses in the world. This alliance enables the brand to generate Japanese buyer interest through Nikkei’s digital platform which reaches over 29 million monthly readers. 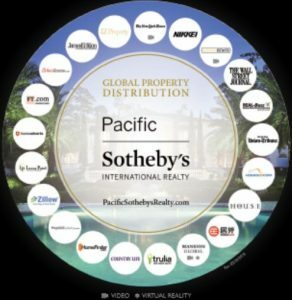 The Sotheby’s International Realty brand is the first real estate brand to present property listings outside of Japan to readers of Nikkei, giving Japanese consumers access to residential real estate offerings in nearly 70 countries and territories. Exclusive agreements with the world’s most influential media partners provide unique access for us to place property ads that target qualified buyers for your home and offer vast worldwide exposure. This includes mainstream partners such as the New York Times and the Wall Street Journal, as well as lifestyle-focused partners such as Ocean Living and Country Life.